The first contains a couple of variants that are worth exploring. The first variant is a fully electrified economy with industry, agriculture, transportation and the like using electricity generated by renewables and a portion stored in some interim form, mostly batteries but also hydrogen in some cases and (cleaner) manufactured hydrocarbons in others. The second variant adds biofuels from woodchips, biodiesel, and biomethane sources to the mixture with continued thermal generation of electricity and greater continued use of internal combustion and diesel engines for transportation. The partially fossil-fuel grid assumes that the negative externalities of fossil fuel generation and transportation fuels can be managed. The expectation is that these will be internalized in the cost rather than remain un-costed negative externalities. This includes carbon dioxide and methane emissions which cause global warming, with the Pigovian tax being some combination of a straight carbon tax, cap and trade, and regulation. This would enforce carbon capture and sequestration in theory, although the practice remains so uneconomic it’s hard to see it working. Pollution negative externalities include loss of productivity via multiple causal mechanisms, additional burdens on healthcare systems and premature loss of life. Yes, we can. The go-to source for this is the work of Dr. Mark Jacobson out of Stanford, recently named as one of the 100 most influential people in climate policy. The Solutions Project he spearheads looks at the transformation globally through 2050. That gives us the timeframe necessary, but to be clear, Jacobson is only looking at direct economic impacts of jobs and the like. He’s not exploring negative externalities in his work. 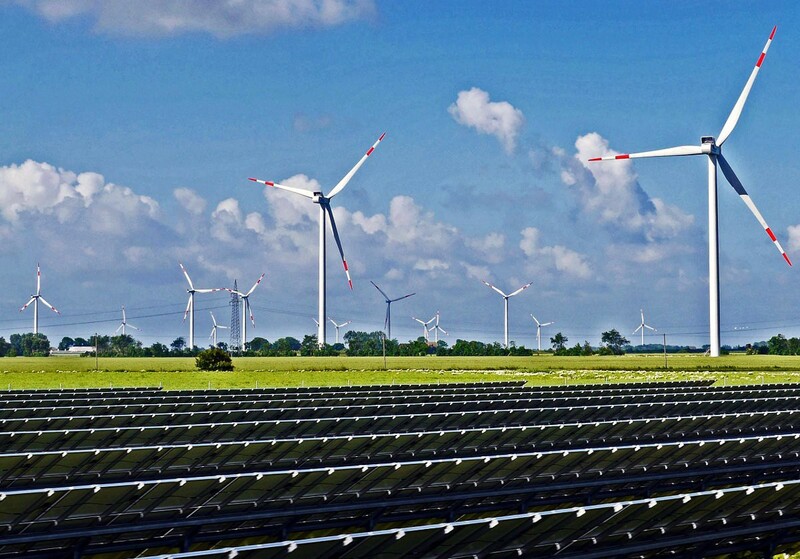 Renewables create more jobs, especially in rural regions hardest hit by the modern economy, than the increasingly capital-intensive fossil fuel industry. Putting up 100 3.3 MW wind turbines across a few dozen square miles of Idaho and then maintaining them takes more people than the equivalent generation in gas or coal. The second is the energy efficiency gains that the infographic calls out at the bottom. That’s a two-edged sword, but the underlying concepts come from this work on energy flows by NREL. 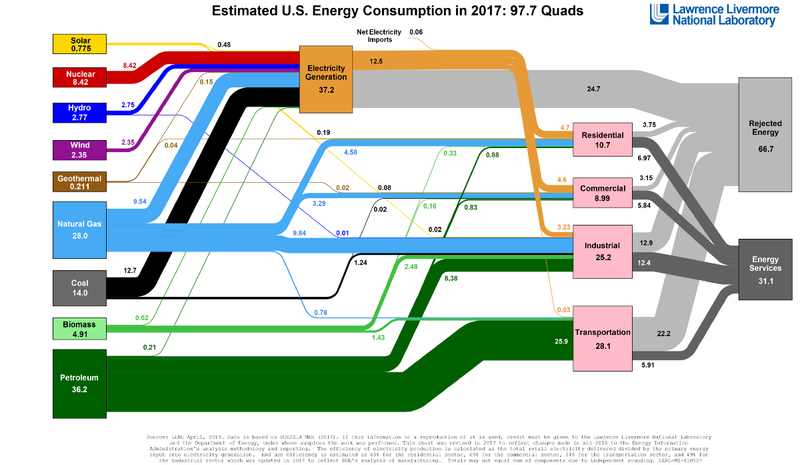 If you expand that in your browser and look at it for a while, you’ll notice all of the gray flows converging on a box in the upper right labeled Rejected Energy. That term is for energy which is in the primary energy source which is not used for effective economic benefit. It’s mostly waste heat from fossil fuels and the management of that waste heat. The modern internal combustion engine is a marvelous piece of engineering, but it runs up against hard limits of the Carnot cycle and the requirement to put a lot of energy into crude oil to turn it into gasoline and distribute the bulky product around. The well-to-wheel efficiency of an internal combustion car (ICEV) is around 16% while a battery electric vehicle is around 80%. Renewable energy doesn’t pay for its ‘fuel’, so there is no rejected energy. While the Betz Limit of 59.3% puts an upper bound on efficiency of taking energy from moving air, there is no cost for the moving air as there is for coal or natural gas. Any discussion of efficiencies has to be put in economic context in other words, and direct assertions of greater or lesser efficiencies are red herrings. Economically, this has implications which must be teased apart. The first way we’ll tease this apart is that cheaper energy is better for the economy. Everything we do requires energy, whether it’s surfing the web or transporting grain from Canada to China in a freighter. If the energy is cheaper, then the gears of the economy are greased. Not throwing away two-thirds of the primary energy is economically advantageous from that perspective. However, the other way to look at it is that there will be economic dislocation. Just as the USA’s poorly structured medical system makes some corporations and people very wealthy and fixing it would make them less wealthy, shifting to the much more efficient, higher-labor renewable economy would take money away from the corporations and people who are part of the fossil fuel economy today. If there were no negative externalities of fossil fuels or if they were cheaper, then this would be a no-brainer, but that’s not the case. Let’s look at that cheaper part first. Lazard is a global investment bank. It publishes an annual assessment of the average, unsubsidized cost of all forms of electrical generation in the fourth quarter. This means that they have removed tax breaks, subsidies, incentive programs, feed-in-tariffs and the like, and are looking at pure cost of production. You’ll note that utility-scale wind and solar generation are the cheapest forms of new-build generation in the world on a level-playing field. In fact, they are so cheap right now that in many jurisdictions it’s cheaper to build new wind and solar generation than to keep operating existing gas and nuclear generation, which along with cheap fracked natural gas is causing bankruptcies and shutdowns in those sectors. Natural gas is just slower to arrive at the problem the coal industry is facing, but it’s already starting to see this issue as well. So primary energy from renewables is cheaper. And we’ve agreed that cheaper energy is better. And that not throwing away a lot of energy is better. Getting energy to where it is needed is a moderately trivial exercise, although one that people keep bringing up as if a tiny town in Alaska or an isolated island is where everyone lives. The current reality is continent-scale grids bringing electricity from near the Arctic Circle in Canada and Scandinavia into New York and Paris, wind generation from the Prairies and offshore to the populated coasts and solar generation from the south to the north. High-voltage direct current (HVDC) is going from strength to strength, with China just unveiling a massive new 1.1 million volt HVDC transmission line using ABB transformers. China is even proposing seriously, at a very high level, a global polar HVDC continental backbone to share electricity around the more populous northern hemisphere. Texas is an interesting case in point. Since roughly 2010 it has increased wind and solar from around 0% to around 18% of its generation. During the same period, it’s gone from last to 34th in grid stability among the US states. Germany is another example. In 2018 it received 40% of its electricity from renewables and had the most reliable grid in Europe. 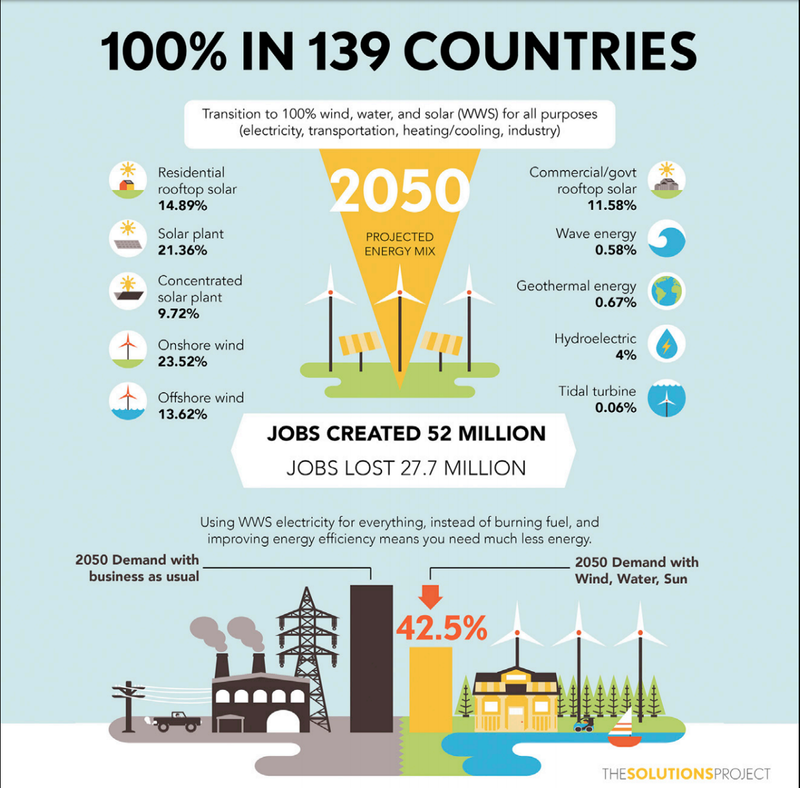 People who claim that renewable intermittency is an issue are cherry-picking contexts free of continent-scale grids, HVDC, and modern electricity markets. But what about those pesky negative externalities? The assessment from Lazard doesn’t look at the cost of pollution or the cost of carbon. It just looks at the cost of generation. What is the cost of pollution? The World Health Organization tracks this. For Europe alone, air pollution costs US$1–1.5 trillion annually in economic costs. And then there’s the cost of global warming. The social cost of carbon is an economic construct that determines the negative economic value per ton of CO2-equivalent emissions. The Obama Administration set it at $36, but that’s understood to be a politically acceptable number, not an accurate one. It’s a good start, but inadequate from a number of perspectives. It’s also not an accurate number to use as a price of carbon via Pigovian taxes, as urgency of change requires a higher number. The correct carbon price is trending to a median of $90 with a calculated high of $180 per ton of CO2-e. Only Sweden and Switzerland are in that range at present in terms of implement prices on carbon. There’s really no reason to assess a mixed economy, except to say that by definition we will have a mixed economy for the duration of the transition, and there will undoubtedly be a long tail. The transition will likely be 80% complete in the second half of the 21st Century and probably 90% to 98% by 2100, but that last 1% to 2% will linger a long time.